All transactions are safe and secure with a reliable history in online purchasing behind each of our associates. 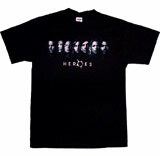 Buy the Heroes Cast t-shirt to own Heroes clothing and merchandise. The design on the left displays the Heroes logo underneath the cast, including Nathan Petrelli and his brother Peter Petrelli. Nathan is a Congressional candidate from the state of New York, who possesses the superhero ability of self-propelled flight. The Heroes t-shirt on the left is perfect for both new and diehard fans of the superhero sci-fi series. In addition to the Heroes Cast tee above, browse the Heroes Clothing Gallery for more apparel like men's and women's clothes, kids shirts or hoodies.